The sale was dominated by two exceptional collections, both exceptional in their quality and containing many items new to the market. Each has been acclaimed as the most important ever offered in their field at auction and this sale catalogue will remain on collectors’ shelves as an important work of reference for many years to come. When a summarising title for the very ‘different’ collection of the late Jim Czyl was required, only “Cinderellas, Locals and the Unusual” seemed to reflect its full extent. This was the day on which obscure and neglected treasures of philately would have their moment in the spotlight, and the collecting public was more than ready to respond. Each result was notable and demand for China material was fierce but, to select among many memorable realisations, the 1872 (ca.) 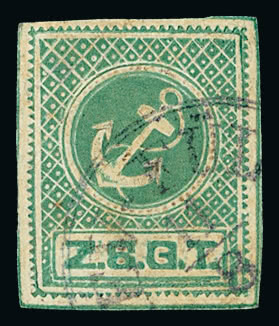 undenominated green stamp (lot 2873, left) issued by the Zala-Somogyi Steamship Company in Hungary, one of just eleven recorded, soared to £3,834. 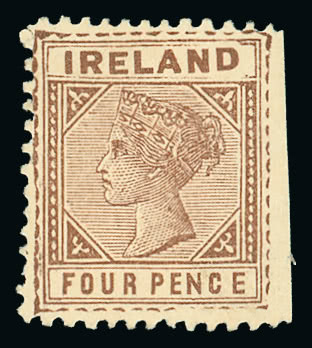 One group of four Irish forerunners in the 1893 colonial design (lot 2896) was pushed right up to £4,600 after another similar (lot 2895) had reached £4,473. 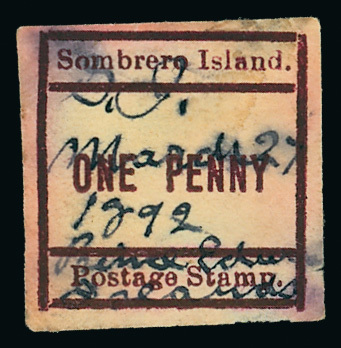 The sole recorded example of the Sombrero Island 1892 1d. 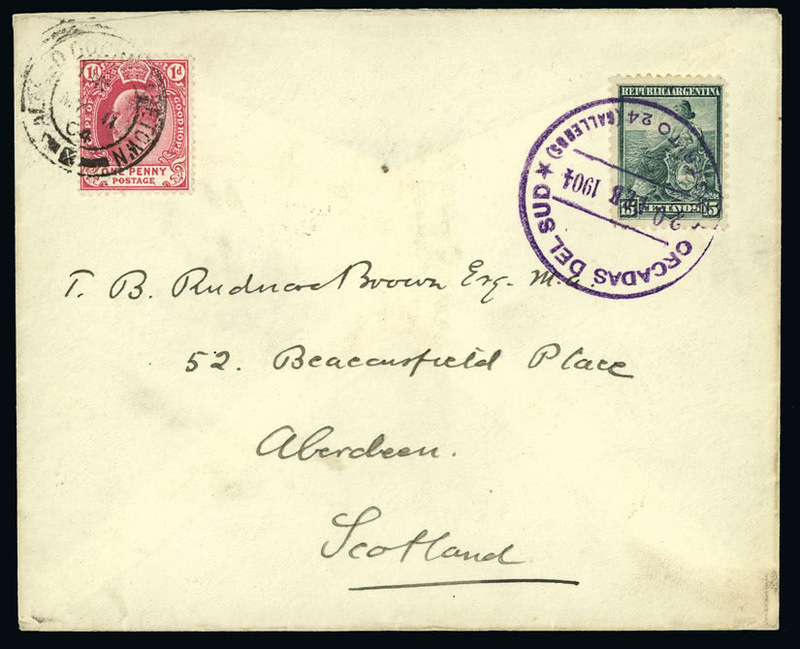 (lot 3001, above) realized £1,251, a very creditable increase on the £598 paid by Jim Czyl when the stamp last passed through the Grosvenor saleroom in 2000. The Falkland Islands & Antarctica concluding session of the auction, a popular and regular event, was again well attended and on occasions even somewhat boisterous as collectors competed for lots from the collection of the late Harry Evans who has been recognized justly as the ‘founding father of Polar philately’. These fascinating items link us directly to the heroic deeds of the early explorers including the tragic Captain Scott. 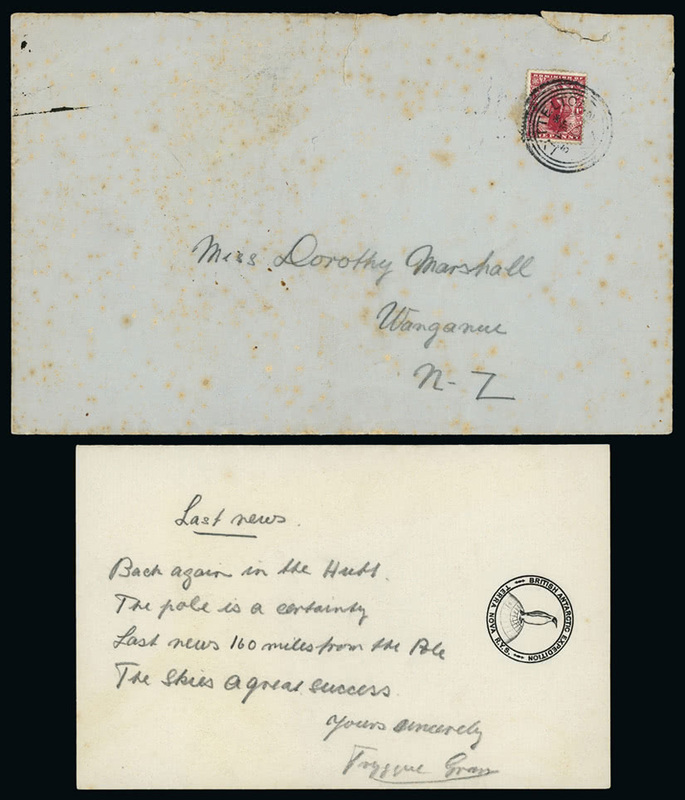 Lot 3981, an official envelope and message from Tryggve Gran, Norwegian ski-expert on Scott’s last expedition in which he declares that “The pole is a certainty”, doubled its estimate at £2,287. Curiosities from the lesser known expeditions, though, caused some of the greatest surprises, although in view of their undoubted rarity this should not have been surprising at all. 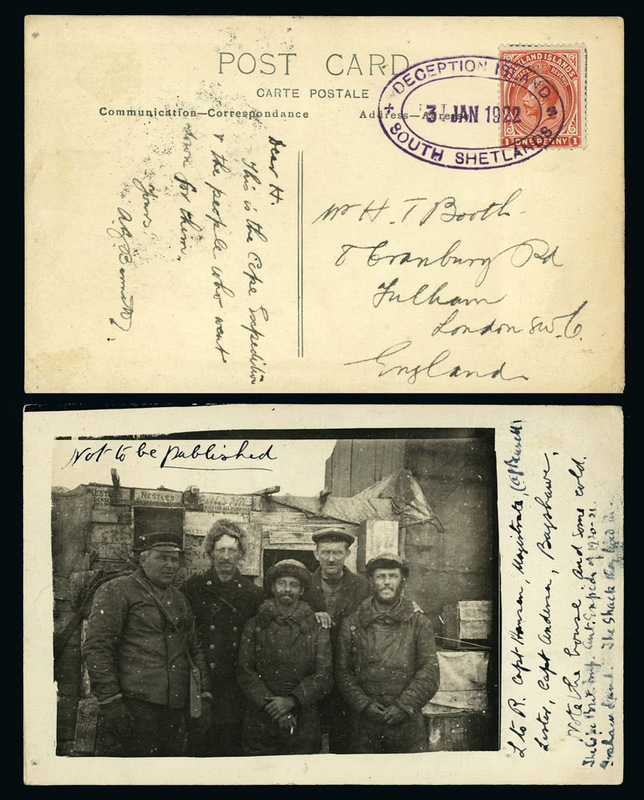 A real photographic postcard showing members of the British Graham Land Expedition of 1920-22 (lot 4017, left) realized £7,020 and among an exceptional group of lots from 1902-04 Scottish National Antarctic Expedition, a card with Argentine adhesive and Orcadas del Sur datestamp (lot 3898) sent to Aberdeen by botanist Robert Rudmose-Brown whilst in the South Orkneys achieved £4,712. The much discussed toilet paper message written by expedition leader William Speirs Bruce whilst out on the ice (lot 3893) found a new home for £1,872. 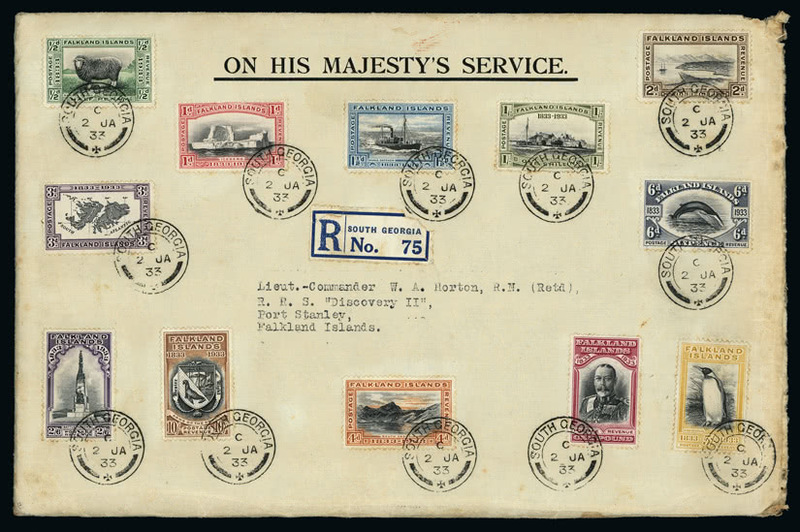 It takes an impressively large envelope to display the whole of the Falklands 1933 Centenary set and lot 4043 had the extra attractions of first day South Georgia cancellations and of being addressed to Lieutenant Commander W. Horton on the RRS Discovery II at Port Stanley. The £7,254 realisation was well deserved. Elsewhere in this auction several significant collections did not pass unappreciated. 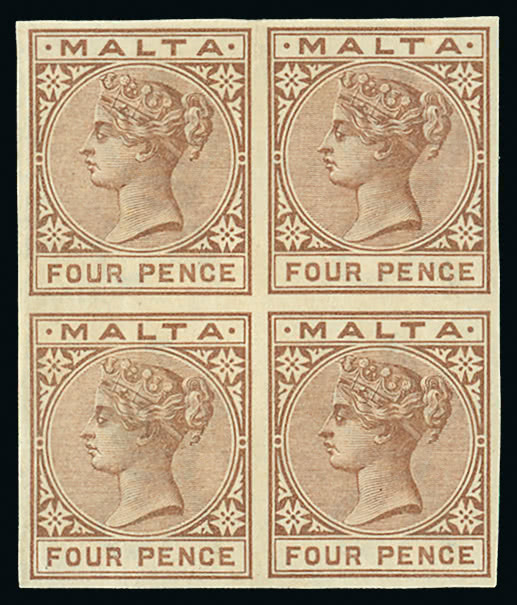 Significant British Europe included a strong section of Malta that featured the Arthur Moyles collection of postal history, an area with prices not currently at their best, but also included an attractive block of four of the imperforate 1885-90 4d. brown (lot 3421) that sold well at £7,638. The John Chillingworth collection of Cyprus contained much interesting material including an early 1504 letter to Venice from the ‘lugotenente’ of the island (lot 3156) that sold for £1,866 whilst greatest enthusiasm was reserved for the collection of cancellations (lot 3189) that reached £2,227. This inspiring auction reflected the great diversity of material appreciated today by collectors around the world. Levels and quantity of bidding for such unusual items can be highly unpredictable . . . but are rarely disappointing. Full listings of prices realised at each auction may be downloaded from the Grosvenor website www.grosvenorauctions.com. Further information is available from Andrew Williams at Grosvenor.